There are 6 door types. All doors are welded at the corners and contain steel reinforcements inside the profiles for maximum strength and durability. All doors by law require toughened or laminated glass. Our doors are manufactured to size in our factory. Hinged doors swing open rotating from the side edges. All doors by law require toughened or laminated glass. French doors swing open rotating from the side edges and always have two opening panels. All doors by law require toughened or laminated glass. Sliding doors slide open across a fixed section. They can be fitted will all glass types. Sliding doors come in 2, 3 & 4 panel combinations. All doors by law require toughened or laminated glass. Bi-fold doors open stacked to the side. They can be fitted will all glass types. Bi-fold doors come in 3, 4, 5, 6 & 7 panel combinations. All doors by law require toughened or laminated glass. 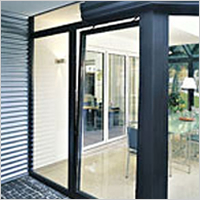 Lift & Slide doors slide open like a regular sliding door except they can be locked open in any position. This allows the window to opened a small amount for air, but not enough for a child to squeeze through and locked in thats position. They can be fitted will all glass types. 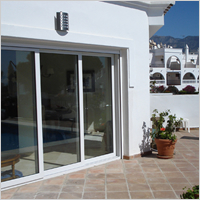 Lift & Slide doors come in 2, 3 & 4 panel combinations.